When I was working on my previous blog post about how Sir Anthony Gidden’s Theory of Structuration helped me link individual and structural sin, I ran a draft past my friend Ryan Thomas Neace. He had asked me (along with others) to read an early draft of his post about what it means to be in one’s debt (you can read the final here). So as I was putting my thoughts together, I sent a copy to Ryan. His response didn’t come until after I had published (I got impatient) but one comment of his really struck home. Ryan liked the post but thought I needed to do much more with a technical concept like “Recursive Discourse”. What Giddens means by Recursive Discourse is that we are aware of how we are using language to construct social understandings. That language arises from prior social understandings and comes already freighted with meaning. When we use the language we’ve inherited about issues like class or race or gender, we are aware that we are incorporating structural conditions into our definition of the world around us. The Discourse is the focus on story. The Recursive is about the ways in which we are simultaneously creating and being created by the story. 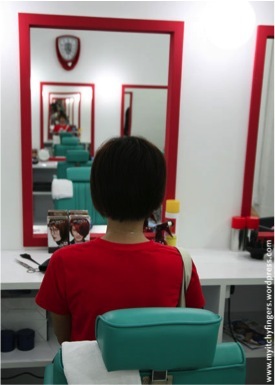 That’s the image I was trying capture with the hair salon mirrors (repeated to the right). So while I was thinking about how to explain this complicated concept, two blog posts related to the Ferguson conversations appeared which give me the handle I was looking for. The first was another marvelous post by Thabiti Anyabwile at The Gospel Coalition. Thabiti’s post shares significant details of his upbringing: family circumstances, a brush with the law as a teen, some issues with illegal substances, pictures in a hoodie showing “dueces”. All features that the media might have used to show him as a thug if he’d been the one shot. He also talks of being an excellent student. He has two degrees from North Carolina State. And yet the stories he tells of being suspected of suspicious behavior just because he met the profile wind up reinforcing how others see him and cause him to respond accordingly. When the campus police hold him so that an assault victim could see if he was her assailant even though he had been playing basketball with faculty members, it reinforces that large black men are likely assailants and that police officers will take advantage of their power in the face of your relative powerlessness. Just in recounting this story, Thabiti no doubt relived the structural sin that was present in that moment. When I shared Thabiti’s piece on Twitter, I got a response from Christine Scheller. She shared this piece she wrote last week, painfully titled “Thanksgiving Thoughts on the Eve of My Late Black Son’s 30th Birthday”. She told of how she and the family had moved out of their racist town because of the comments that were already coming to her third grade son (told he should put a white mask on his face). She tells of how life developed in a more stable environment in New Jersey until her son enrolled at Wheaton College. At the point he faced a barrage of racial jokes and accusations. Wheaton is not responsible for his suicide but it was part of the contributing factors. How does a young black man learn to manage in an environment that allows marginalization of his very identity, whether in third grade or as a freshman in college? How do jokes and comments, video images, or people crossing the street with you approach on the sidewalk become part of your story? In every encounter, the structured inequality is reproduced and performed in speech. Christine goes on to share some remarkable parts of her own upbringing. Of how she had her own troubles with the law, arising out of some family circumstances and reckless behavior. But her story does not completely reproduce structure because she’s a white woman, educated, and has a blog. Nevertheless, the very telling of the stories she shares whether of her or her son seem to reimage racial and social class disparity. Just as Thabithi’s stories reproduce structures. In the moment of telling, he’s in the back of that police car. In sharing, she is reproducing her childhood social status. If this is true for Thabithi and Christine, who have moved far beyond their original circumstances, it’s not a stretch to suggest that Michael Brown and his friends relived these structural inequalities in the midst of daily interactions. It became part of their story and reminded them of their powerlessness every day. Yes, Brown bears a degree of responsibility for his actions on the day in August. But that’s not the full telling. Thabiit closes his post correctly arguing that the real structural sin is not racism or police abuse of authority but the failure to recognize the Image of God as being present in the Other. I fully agree and would only add that restructuring our discourse to creating justice makes seeing the Imago Dei in the Other a truly sacrificial act. One that might just break the narrative structures that are so common in the air around us. If we have the courage to tell a different story. One that affirms God’s creative and redemptive acts in our midst and the indwelling of His Spirit to birth the Kingdom of God. Just imagine the recursive power of that story! Great post, sheds a lot of new light, very, very helpful.